After the British deployed the first ever tanks in 1916, their allies rushed to imitate the design. 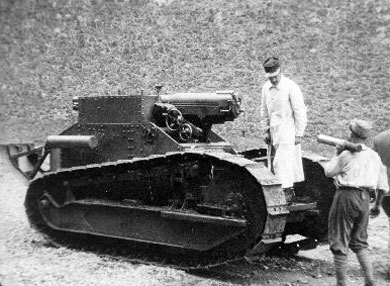 The Schneider Assault Tank that appeared in 1917 was one of the first French creations, based on the chassis of an American Holt tractor. Having sold this flawed but useful weapon to the Army, the Schneiders looked for ways to replicate their success. The result was the Schneider Self-Propelled Gun. A Panhard engine was coupled with a Holt track unit to create a vehicle that could carry a 220mm Longue Mle gun. The gun’s recoil sent it back up an inclined plane, where it was stopped by a hydraulic buffer. Gravity then returned it to the firing position. The gun could not traverse independently of the carriage. This left it without the degree of control and accuracy needed to be effective at the time. Schneider self-propelled 220mm gun Unlike the Saint-Chamond design, this chassis moved without the help of a secondary ammo-bearer vehicle. In 1918, the Saint Chamond Company brought its contribution to the world of self-propelled artillery. It was an eccentric creation, made using not one but two Holt tracked chassis, both driven by electric motors. One carried either a 194mm gun or a 280mm howitzer. The other carried ammunition and the petrol-powered dynamo that provided electricity for both motors. The two were connected by a rigid drawbar but could be detached once the gun was in position, allowing the power and ammo vehicle to drive away. Fewer than a dozen of these vehicles were built. 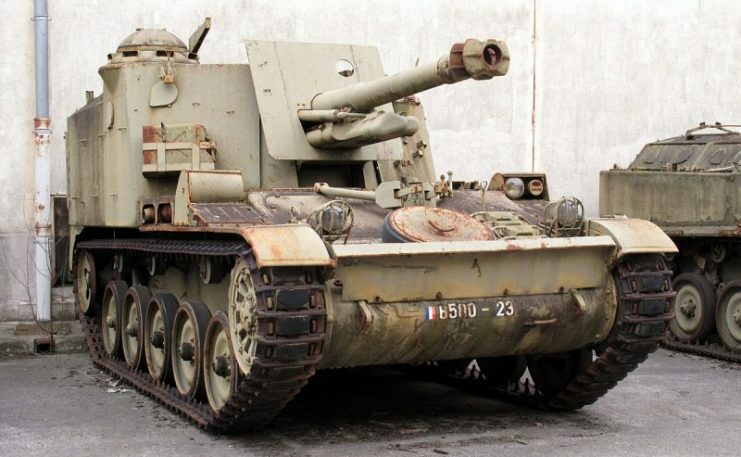 Like Schneider, the Renault company decided to adapt their early tank design to create a self-propelled gun. Taking the chassis of their successful FT-17 light tank, they took away the turret and flattened the superstructure as much as possible, creating a platform on which a 75mm field gun was mounted. The gun on the Char Canon pointed backward, so the vehicle had to be reversed into action. It gave no shelter to the crew, who were left entirely exposed to enemy fire, and firing the gun put a great strain on the chassis. Though several prototypes were developed, it never saw action. 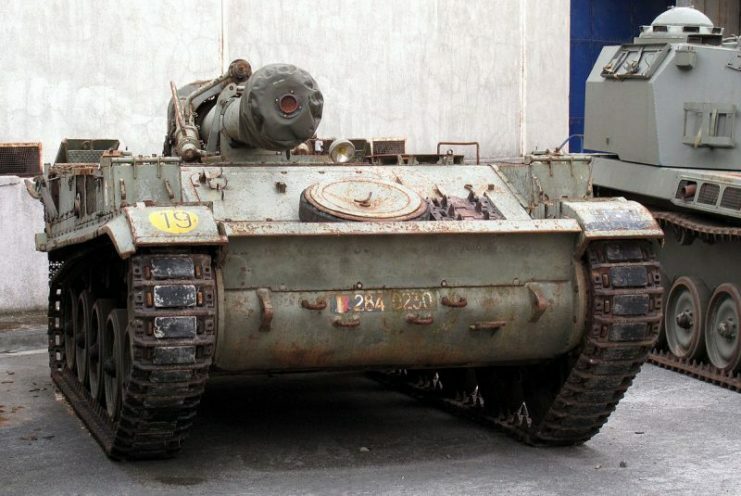 Thirty years later, French engineers were still using tank chassis as the basis for self-propelled guns. When the AMX-13 proved to be one of the most successful tanks of the post-war period, it was natural that designers would adapt it in the early 1950s, producing the AMX 105mm self-propelled gun. 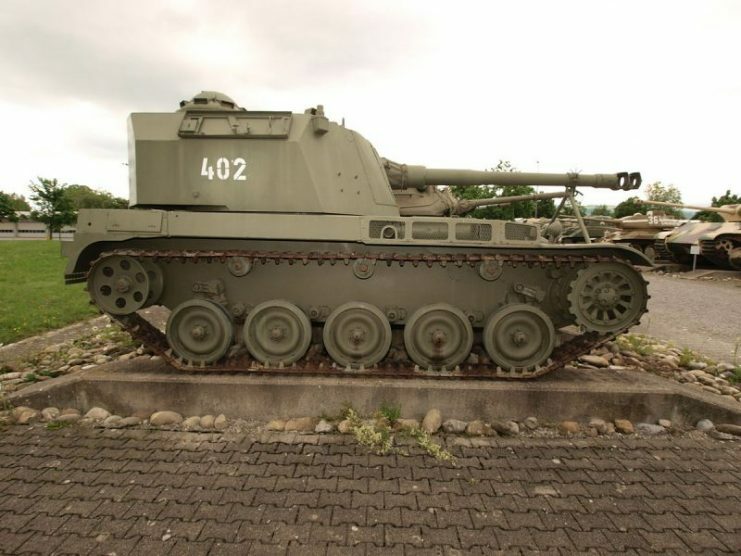 The AMX 105mm’s weapon was mounted in an armored box covering the rear half of the hull. This box also contained a spacious crew compartment and space for 56 rounds of ammunition. AMX 105mm Mk 62 Self-Propelled Howitzer at the army base Thun, Switzerland. 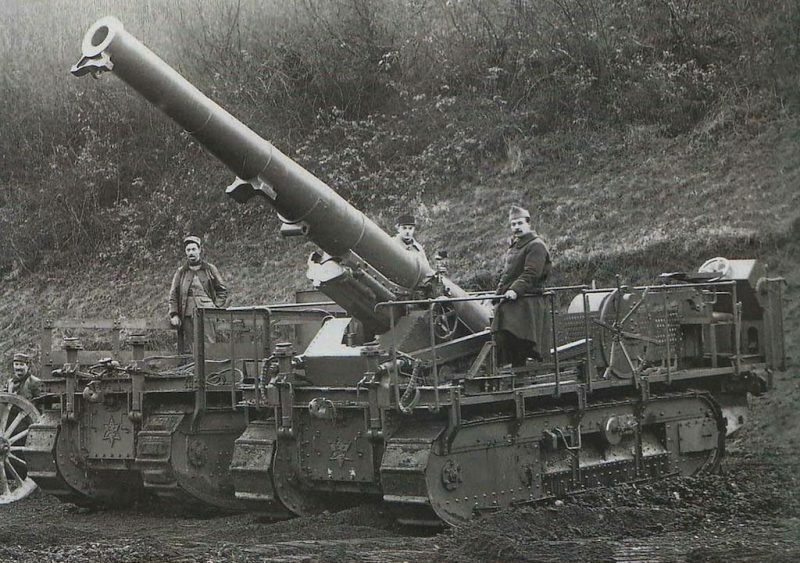 The driver and engine were mounted in the front, beneath the barrel of the gun. Though the box was fixed in place, the gun could traverse 20 degrees in either direction. An effective weapon, this model was used by France, Israel, Morocco, and the Netherlands. AMX-13 on display at Saumur Général Estienne museum. Photo: Rama / CC-BY-SA 2.0. Ten years later, another weapon appeared riding on an AMX-13 chassis. 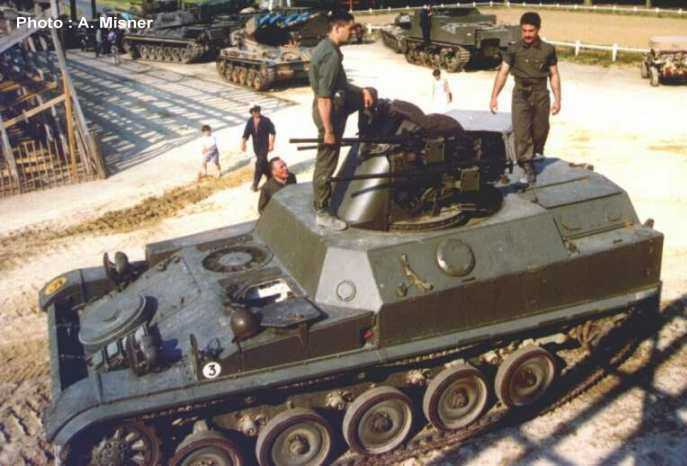 This was the AMX DCA 30, a self-propelled anti-aircraft weapon. 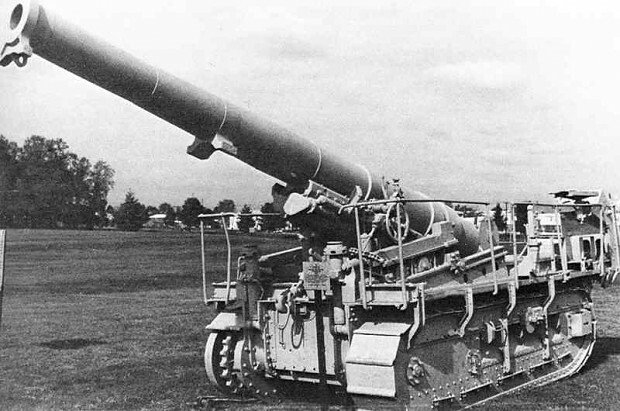 Instead of a fixed box, the DCA 30 carried a cast turret fitted with a pair of HS 831 30mm automatic guns. A folding dish toward the rear of the turret fed data to an Oeil Noir (Black Eye) radar system, used to direct the guns. This was another success for French military vehicle design. Production for the French army was carried out between 1962 and 1965, after which more were made for export. AMX DCA 30. Photo: Antoine Misner / CC-BY-SA 2.0. 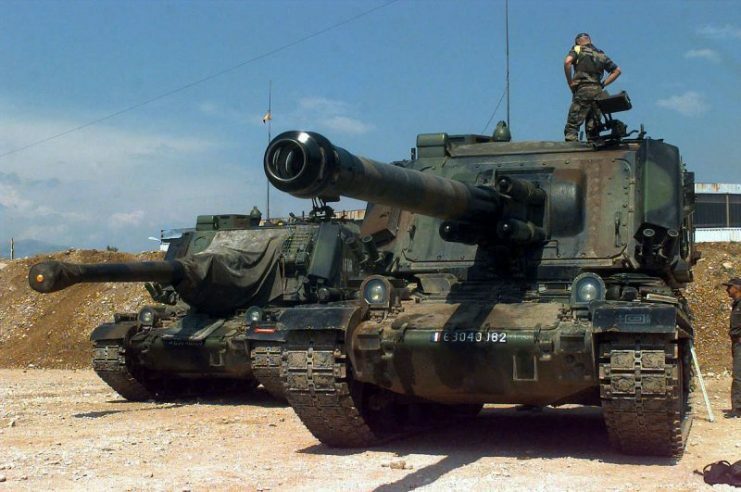 Appearing in the mid-1960s, the F3 howitzer gave the French a heavier self-propelled gun than their previous versions. It’s 155mm gun was so large that it could not be contained inside the vehicle’s armored body, which was again based on an AMX-13 chassis. Instead, it sat on top. There was no space in the vehicle for most of the crew and ammunition, which were carried in a separate vehicle – a feature reminiscent of the Saint Chamond gun. F3 Howitzer on display at Saumur Général Estienne museum. Photo: Rama / CC-BY-SA 2.0. Before firing, the F3 had to stop and lower spades designed to counter its recoil. The crew manually elevated, traversed, and loaded the gun while standing on the ground around it, exposed to any nearby enemies. Despite its drawbacks, the F3 was sold to Kuwait and several South American countries. 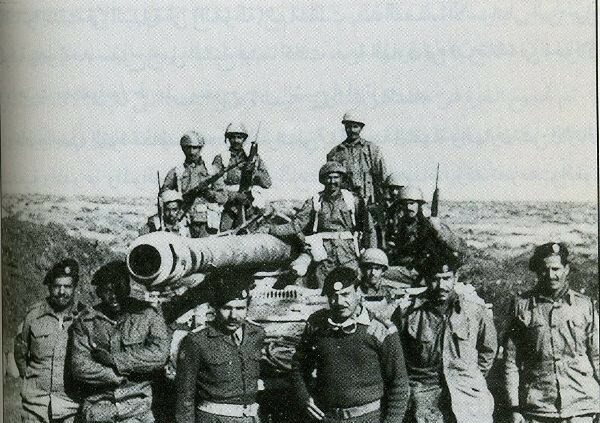 AMX-13 Mk F3 155mm of Kuwaiti Army in Syria 1973. Produced in the 1970s, these vehicles were designed by Hotchkiss-Brandt and later built by Creusot-Loire. Instead of adapting an existing tank chassis, this time vehicles were custom designed to carry Crotale anti-aircraft missiles. 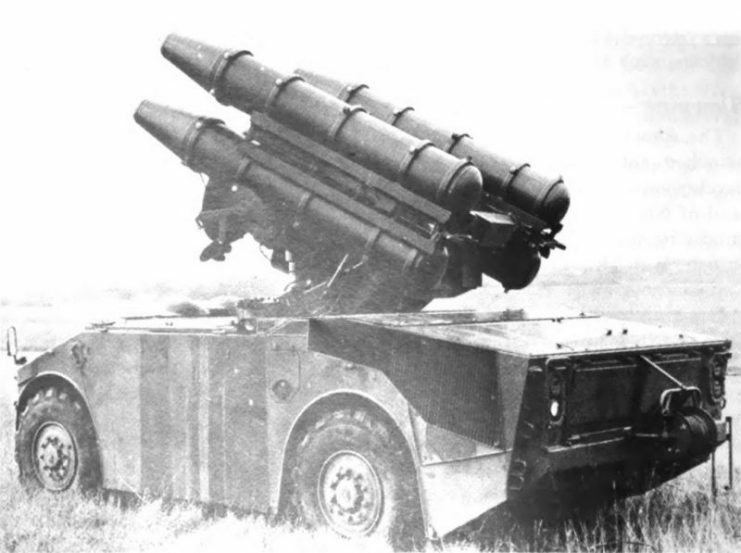 The system consisted of two separate vehicles, one carrying four missiles in their launchers, the other a targeting system. The targeting computer would pick out targets, then feed them to the other vehicle via a cable. Once missiles were launched, a small radar on the firing vehicle guided them home. The Crotale had a range of eight-and-a-half kilometers and could reach altitudes of up to three kilometers. French Crotale system with four missiles. A replacement for the F3, the GCT overcame the serious limitations of the previous weapon. This time, the 155mm gun was mounted in a heavily armored, fully rotatable turret on the back of the chassis from an AMX-30 tank. There was space for all the crew inside the vehicle, which offered protection against not just conventional attacks but nuclear, biological, and chemical contaminants. The GCT carried 42 rounds that used combustible cartridge cases. At maximum rate, it could fire eight rounds per minute, though it usually only fired one or two in that time. This beat the F3’s fire rate of one to three shells per minute. The GCT’s crew could stay safely sealed inside their vehicle when in the combat zone, even resting in rotation in a built-in bunk bed.